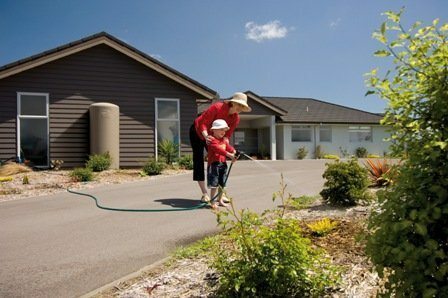 For over 25 years Devan Tanks NZ have been providing water storage tanks and water tanks NZ trusts for commercial, residential, and agricultural use. Devan Tanks NZ commenced operations in October 1988 and has been involved in the design, tooling, manufacture and distribution of a range of rotationally moulded plastic products ever since. Focusing primarily on the agricultural, rural lifestylers and domestic market sectors since conception, Devan has grown into a specialist operation that is dedicated to its customers. Devan’s core business is the manufacture of water tanks, ranging from 600 – 30,000 litres used for agricultural, domestic and commercial purposes including the storage of molasses and chemicals. More recently Devan have updated their range of septic tanks and wastewater treatment systems with a new design. Devan’s septic tanks are watertight, strong, lightweight and easy to install. Devan also manufacture and market an environmentally friendly multichambered household Wastewater Treatment System. This system treats household wastewater to a level to that produces effluent which is a clean, clear and odourless liquid suitable for irrigation of landscaped areas. Devan has also developed a range of drums (100 & 200 litres) which have attained United Nations dangerous goods safety ratings for the transport and storage of chemicals. These drums can be manufactured to suit a range of applications and come in an extensive range of colours. Over the past few years Devan have exported into several Pacific islands, and is still growing with further development in the Pacific region. Our prime location near Tauranga and Lyttleton Ports have made exporting our product range into the Pacific a simple and easy process. Devan Plastics’ Head Office is located in Tauranga, in the Bay of Plenty – one of New Zealand’s fastest growing regions. Devan’s manufacturing and distribution centres are located in Tauranga and Christchurch which have the benefit of being able to provide excellent customer service to both North Island and South Island customers.